We all know that trackers are tools, right? Simply a very fast way to get from A to A in a big, dusty circle and nothing more. Making them look beautiful would serve no logical purpose. You may as well decorate a shovel or bedazzle a hammer. Except no. 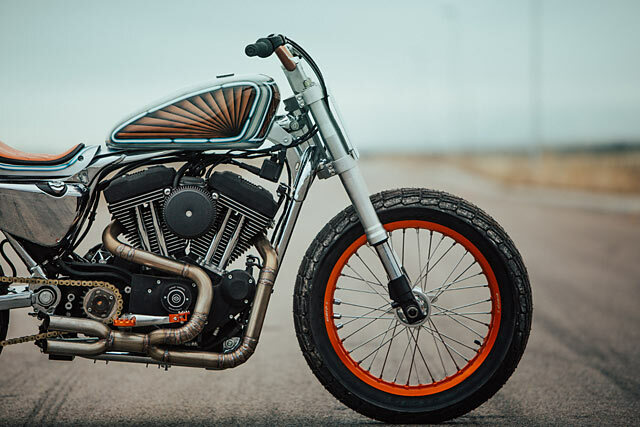 See, Utah’s Tyler White obviously didn’t get the memo and he’s gone about creating a Harley XL1200R tracker that’s pretty damn easy on the eyes, too. Bang Moto is a small shop that has been through several different phases. It started as a small side gig to make a little bit of extra college money, mostly by helping Tyler’s friends build their bikes. Then for a while it was located in a decent-sized shop where Tyler would take on pretty much any kind of motorcycle work he deemed fit. “Several shop spaces later, it is now located in the garage at my house. I will take on one or two customer builds a year, but for the most part I just like to work on my own projects”. 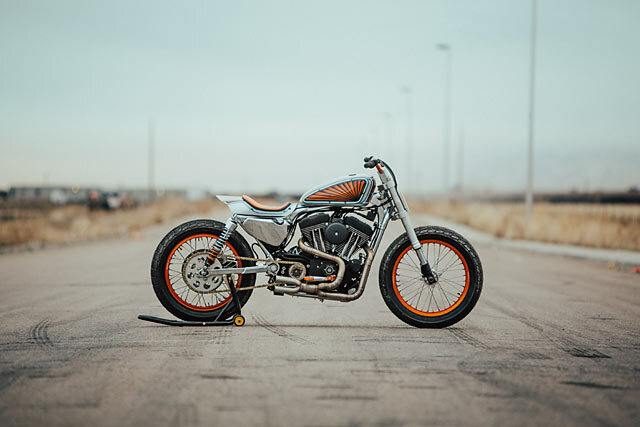 This is a 2006 Harley Davidson XL1200R that Tyler found in the small town of Mantua, Utah. It was in perfect condition and only had a minuscule 3000 miles on it. 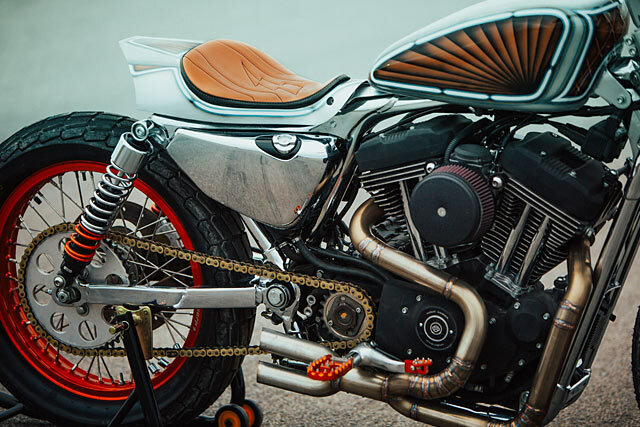 “It was built for a budget of around ten grand, so I wanted the bike itself to be relatively inexpensive. It had a rebuilt title and only cost three grand, which was a killer deal and seemed to fit perfectly because the bike was going to raced”. “When I am not in the shop, one of my favorite pastimes is riding dirt bikes. I like to think that all of my builds have some kind a dirt bike influence. This build in particular is covered in anodized Warp 9 components. 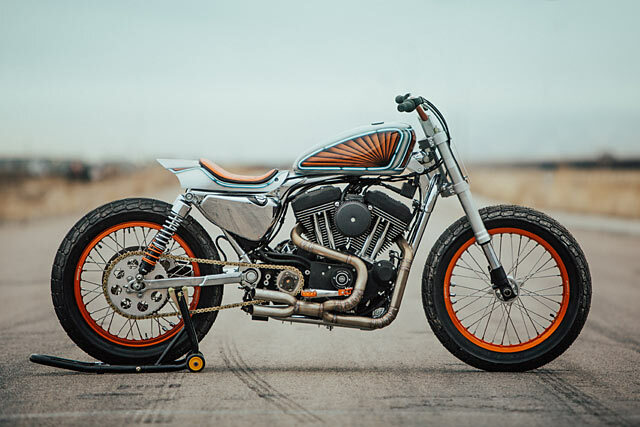 It is obviously intended to be a very functional flat track race bike with the seat cowl, no front brakes, no lights and the 19 inch wheels”. But to add a little something extra to all that race winning technical bad-assery, Tyler settled on a custom paint job. 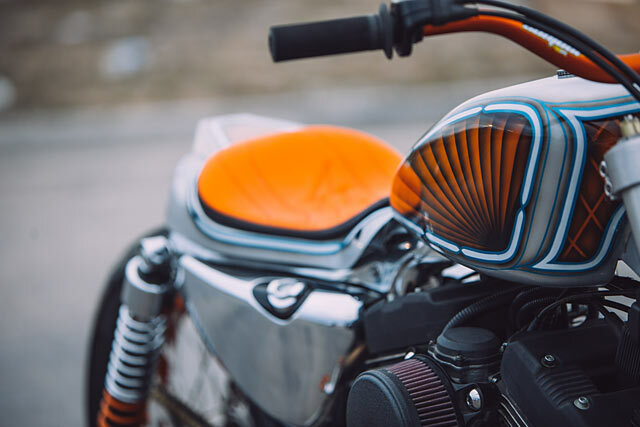 “It was going to be a Mexican blanket-style pattern, but there was not enough time to have that done before it had to be at the One Moto Show, but I still wanted it to have some kind of a club bike-style paint job, so we just found a design that looked good and ran with it”. The first thing built was the exhaust and it was achieved using 304 stainless tubing. “If I had to pick a favorite part of building a bike, it would have to be the exhaust. Probably because it is the first thing I look at on everyone else’s builds”. Then Tyler commissioned Shane at local shop Chainsickle to machine the new triple clamps for the front end conversion; the forks they’d soon be clamping came off of a Hayabusa 1300. 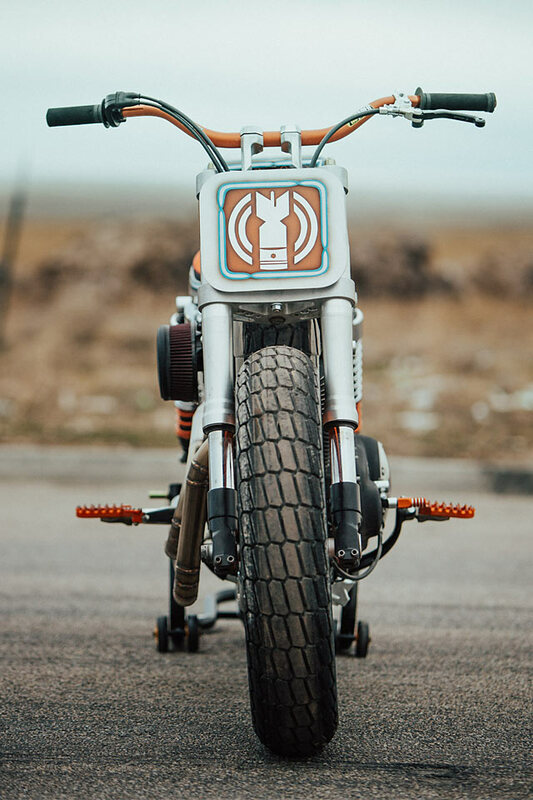 “Working with Warp 9, I was able to find a front wheel that matched the front axle size, but for the back wheel I didn’t have as much luck. So I ended up ordering a spoke kit through Buchanan Spoke and finding an akront-style rim and then I had it anodized to match. 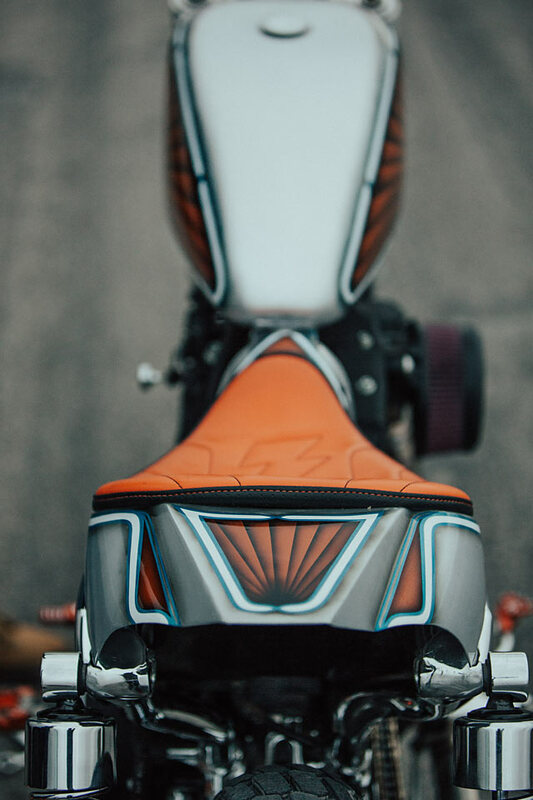 Next came the seat cowl; I had the local upholsterer dream up this radical lightning bolt seat”. When asked what the hardest part of the build was, Tyler nominated the seat cowl. “There’s a lot of the fabrication processes that make perfect sense to me. Shaping sheet metal is not one of those things. With stretching and bending metal, there can be much cause and effect to different parts of the piece that you are working on. It’s something that I hope to put a lot more time into, mainly because it opens up being able to get so much more creative with a build”. Tyler was quick to answer when asked about his favourite part of the build. “The exhaust on the bike looks and sounds amazing. I was very pleased with the way the two-to-one-to-two pipe design turned out. Also, there is nothing more rewarding to me than getting those great-looking purple and blue welds on stainless pipe. That, along with the Dynojet kit that I used, really woke this bike up and gave it some much-needed power for the race track”.